I only own one Buffet Server. 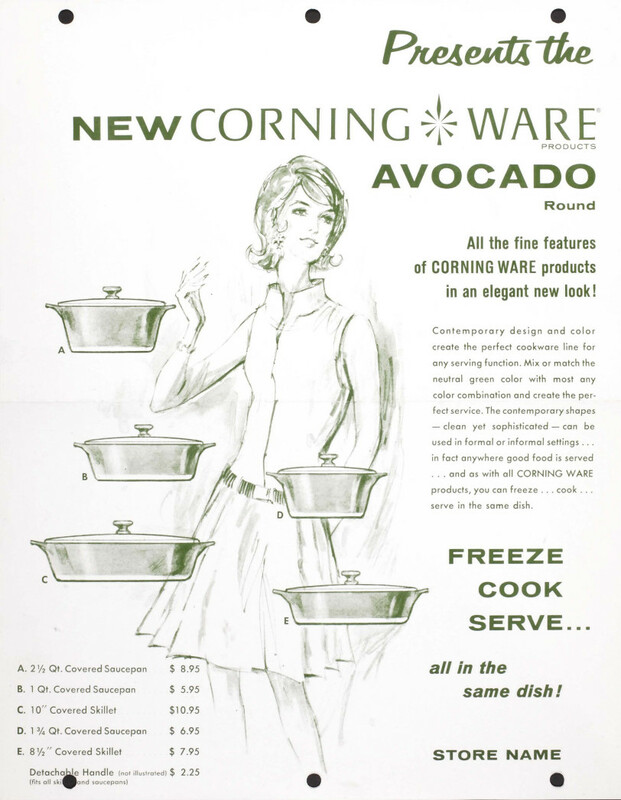 I bought it years ago, because I had originally thought that it was an interesting round shaped Corningware Skillet without a pattern printed on it. After all, there are many Just/Simply/All White pieces out there, and my Mom's Electromatic Table Range came with a plain white skillet as well. So I just assumed.... Well, you know what they say about assuming. It was always lidless, but it came with an interesting handle that, at the time, I had never seen before. It is a P-series compatible version of what would become the A-series handle. More appropriately referred to as P-201-HG. and finally in 1975 with the release of Merry Mushroom at Sears. This was the "round" Corningware that I was familiar with as a child. 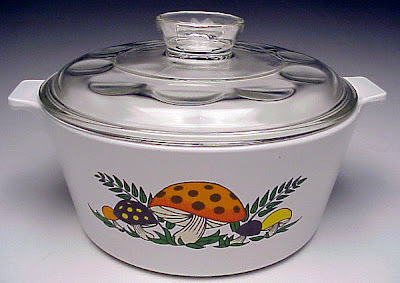 So I spent several years looking for a "Merry Mushroom" lid to fit this little 1 quart (B-1) saucepan. 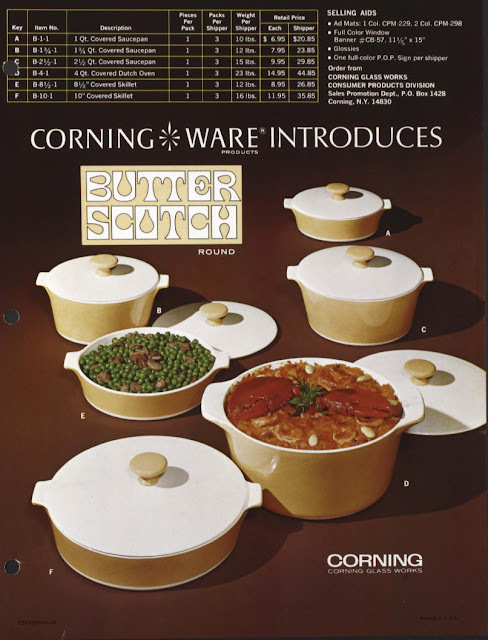 That was before I found out that it was suppose to have a white pyroceram (Corningware formula) lid with an ultra sleek & chic bakelite knob. (although in 1965 they offered Red and Yellow lids too) Well, I FINALLY found one at the Thrift store the other day. OK, I should qualify that... I found one that didn't have a "blistered" bakelite knob because someone used the lid inside the oven set for over 350F degrees. Which is a definite NO, NO; and one of the reasons later versions had either Pyroceram knobs or Ceramic knobs. Now Buffet Server is complete. WooHoo!! And now it's looking better than ever. I didn't even realize it, but I own one of these (I think). 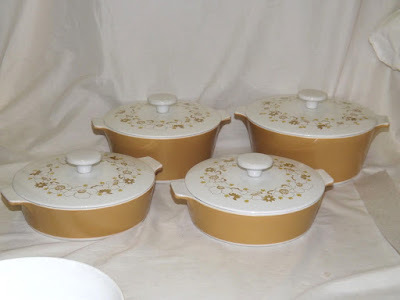 I have the butterscotch round, but I don't have the lid. I just thought it was a coloured version of the round cake pan P-321. I didn't realize it was an entirely separate thing. It has a really weird nomenclature stamped on the back though. It's a bit blurred, but I think it reads B-1-1D or B11D. Perhaps it's not part of the buffet server series and something else entirely. On a completely unrelated (though somewhat related) note, I finally found my brownie 8x8 pan (P322). I walked into a thrift store in another town on a whim and found both a P322 and a loaf pan. I'd been searching for them for a long time. The only downside is that the brownie pan has absolutely no gloss on the inside anymore. The previous owner must have scoured it all away. This is extraordinarily helpful, thank you! I just found a perfect buffet server b-1 at a thrift store today. The knob is pristine, but I don't have the cool handle. I will be sure not to use the lid in an oven over 350. I have read that these are safe on the stove top as well. Is that correct? Can they be used on both gas and electric ranges? I just bought one with the lid. I thought it was a soup pot. I would like to know if I can use it on top of my stove. I've had two white 1 quart rounds: one marked, "Buffet Server" and the other marked, "Centura"-both lidless. Yesterday, I found a very dirty, white 2-1/2 quart round marked,"Centura" with a white pyroceram lid with a white knob. How can tell if the knob is made of pyroceram or ceramic? What a beauty it is! After I cleaned it up, of course. I've been collecting the glass lidded rounds such as Merry Mushroom; but now I'm going to start collecting the other rounds, as well. They're so handsome in their white coats! Excellent finds! 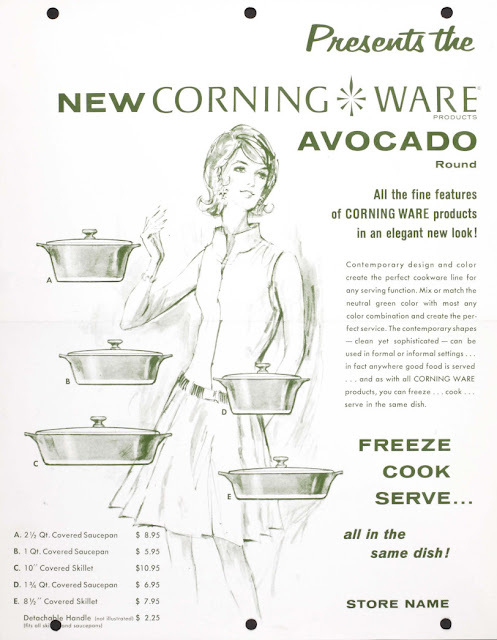 The white knobs from "Corning Ware Round" and Centura "Cook N' Serve" lines are made if porcelain ceramic, instead of glass-ceramic. They are beautiful pieces.